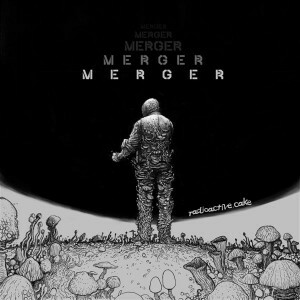 Radioactive.Cake returns with his timely fourth album, Merger, released on Glitchy.Tonic.Records. This time around he has remixed some of his favourite tracks by some of his favourite artists, tearing apart the originals and reassembling them in his own idiosyncratic style of edgy progressive psytrance. Remixing, as an artform, is about transformation, interpreting music in a new light from a different perspective, but it it also a way of paying respect. In the words of the artist: “this is my kind of tribute to those who paved the way and also to those who try to go further and build upon it.” Artwork by Yaroslavers. Mastered at Anti-Logic, Berlin. MP3 Download | FLAC Download | WAV Download · Download count: 13,663. Released under a Creative Commons license for noncommercial usage. If you enjoy this release please consider making a donation via Bandcamp. If you do you will be treated to nine additional Radioactive.Cake tracks as a bonus! Yeah, this album is a real piece of work. You take the best and brightest prog/zenonesque artists who crafted Cake’s already delicious tunes into something even better! Great job!! Yeah, that’s a nice comment. Tchud Trance! I could add that the direction taken is quite minimalistic, so it would take a real master to create such a delicate and craftily sounding masterpiece like the one we hear here. Congratulations to the author/composer! this is a great release, i really feel RadioActive Cake improves with every album. the original songs provide great source material for him to craft really nice stompy belters, throbbing with a dark energy and manic style. cool ! thanx for feedback. seems it’s good, which is nice to see. trying to be better which each new release, anything else wouldn’t make sense to me. @Acidhive: LOL I get it, hope y’all know what I mean. Cheers! Revisiting this album, I can’t but think that this is really quite a landmark in the development of the genre! It will stay up above many others for a while, I bet! Really amazing album, great taste in songs to remix with and an outstanding job retaining the personality of the original producers while showing us what you bring. Really grateful for this!! I know it’s the same guy, but wasn’t “machinery of nature” originally released by terrafractyl – not by hypnagog? Great selection of tracks and very creative remixes :) thanks! dark, strange, bewitching, swinging <3 just perfect tracklist and amazing remixes. Wow that Fagin’s Reject remix seals the deal! I would like to give 15 out of 15 Stars!